Sun-Hoo Foo graduated from Chung Hwa High School in Brunei. He went on to receive his medical degree from the National Taiwan University College of Medicine, in Taipei, in 1972. In 1974, he co-founded and is a regular contributor to “Medicine Today,” a magazine for physicians; in 1989, he also co-founded “Health World” for the general public. He co-translated several works from English into Chinese, including Freud’s Interpretation of Dreams. 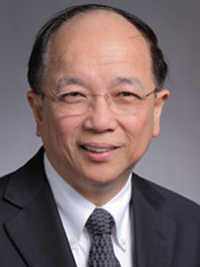 In 1976, Dr. Foo completed his medical residency at St. Vincent´s Hospital in Bridgeport, Connecticut; and his residency in neurology at New York University Medical Center in 1979. He became Director of Neurology at New York Downtown Hospital, then New York Infirmary-Beekman, in 1981. During his 30-year tenure at the Hospital, he served as Treasurer and President of the Medical Board. He has been a member of the Board of Trustees of New York Downtown Hospital since 1999 and was the recipient of the Chairman’s Award. In 2008, Dr. Foo was honored with the Distinguished Physician Award by New York Downtown Hospital. He is currently the Chief of Neurology. A Clinical Professor for the Departments of Neurology at NYU School of Medicine, Dr. Foo practices general adult neurology. His areas of expertise include stroke, headache, and facial and back pain. As a researcher, Dr. Foo has done much to bring public and professional awareness to health disparities among ethnic populations in New York City and across the country. He has dedicated his career to serving the North American Chinese community and to the development of excellence in medicine. Among many professional affiliations, he has been instrumental in the growth of the Chinese American Medical Society (CAMS). He served as Chairman and as President of the Federation of Chinese American and Chinese Canadian Medical Societies (FCMS) from 2004 to 2006. He has published research on stroke, dementia, normal pressure hydrocephalus, Parkinson’s disease, and brain tumors, and was co-investigator for several NIH grants including the Chinese-American Cardiovascular Health Assessment (CHA CHA). He is also a co-founder of CAIPA (Chinese American Independent Practice Association) and AAACO (Asian American Accountable Care Organization). Dr. Sun-Hoo Foo is a much admired and respected professor and physician. He was listed in New York Magazine’s “The Best Doctors” in 2007-2010; America’s Top Doctors 2008-2013; and has been consistently profiled among the “Top Doctors” in the New York metropolitan area in the Castle Connolly Guide since 1994. His many awards include recognition as an Outstanding Asian American by New York Governor Mario Cuomo, a Distinguished Trustee Award from the United Hospital Fund, a Distinguished Physician Award from New YorkDowntownHospital and the Wholeness of Life Award Citation from The Healthcare Chaplaincy. Dr. Foo lives with his wife and family in Alpine, New Jersey. His son is a clinical instructor of neurology at NYU. He has three daughters – two are lawyers and one is an MBA.